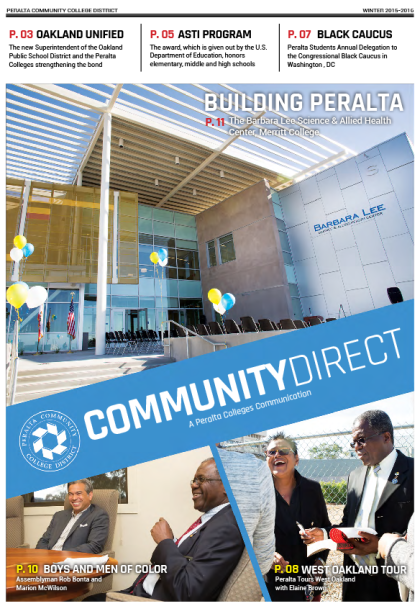 Welcome to our first edition of Peralta Colleges’ Community Direct, an overview of activities at the Peralta Community College District by Chancellor Jowel C. Laguerre, Ph.D.
Community Direct is short for the Chancellor’s Direct Communication to the Community. In Community Direct, Dr. Laguerre highlights not only his activities, but those of the Board of Trustees, the Peralta Colleges’ presidents, faculty and staff — and, of course, our community colleges’ students. Community Direct is meant to be a communication tool to keep you, our community, informed about Berkeley City College, College of Alameda, Laney College, Merritt College and district activities. If you have any questions about Community Direct, or have something to share, you can write Dr. Laguerre directly at jlaguerre@peralta.edu. Enjoy Community Direct and Happy Holidays!